An hour and a half? The most notice that NORAD had of any of the hijackings was nine minutes. Did the FAA and NORAD have systems and procedures that were inadequate to handle the 9/11 attacks? Of course. Is there evidence that anyone in those organizations deliberately failed to act on a known threat? Absolutely not. Bottom line: smart and determined Jihadists took advantage of weaknesses in U.S. defenses. They planned extensively, they trained extensively, and they pulled off a spectacular terrorist attack. For specifics on how the attacks were planned and executed, read the 9/11 Commission Report. Links to accurate information about the FAA and NORAD response on and after 9/11. WTC building 7 had small fires? 30 other firefighters who were on the scene and say that the fires in WTC 7 were enormous. The official collapse explanation is that jet fuel melted the columns? If Mr. Rodriguez had bothered to read the engineering studies about the tower collapses, he would know that nowhere do they conclude that jet fuel melted any columns or that the fuel was the sole cause of the collapses. His statements are classic "straw man" arguments, and display complete ignorance of the topic. For a summary of the "official" cause of the collapses, see the NIST FAQ at the top of this page. No steel frame building ever fell due to fire? More typical 9/11 denier nonsense about steel structures and fires. Steel performs poorly in fires: that's why building codes require that the structural steel in office buildings be covered with thermal insulation. Without that protection, steel can fail extremely quickly under normal fire conditions. The towers did not undergo normal fire conditions: they sustained severe structural damage, severe fires on multiple floors simultaneously, and loss of thermal protection. For much more information about this topic, including the collapse of steel buildings due to fire, please go here and here. That's an outright lie. Rodriguez himself spoke to leaders of the NIST investigation. NIST produced the 10,000 page engineering study that is the "official" version of the tower collapses. 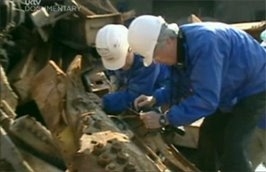 Their investigation into the collapse of WTC 7 is ongoing. Independent engineering investigations into the collapses were done. None support the conspiracist claims in any way. No relevant experts who studied the issues agree with the conspiracy-mongers. 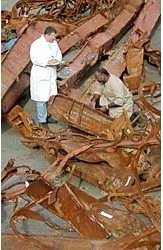 WTC steel was shipped away to hide evidence? This is yet another common conspiracist canard, promoted by people who can't be bothered to learn about the events they claim to be investigating. As with most 9/11 conspiracist claims, there is absolutely no evidence to support this assertion. First, FEMA "hauled away" no steel, or anything else, from the WTC site. Rodriguez, as usual, casually spouts a baseless accusation. Second, the steel from the site was removed over a nine-month period, not "in weeks." 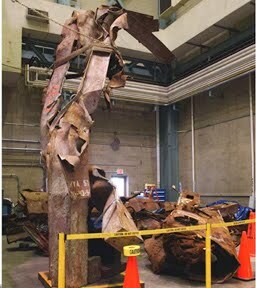 Third, during September, 2001 some of the steel was removed to recycling centers as part of the huge rescue and recovery operation, to prevent further damage to surrounding structures, and because no one asked that it be retained for examination. Who organized and supervised this operation? Ken Burton and Mike Holden of the New York City Department of Design and Construction. Why were Burton and Holden in charge? Because they were the first to set up an office near the site and because they could marshal the heavy equipment necessary for the rescue operation faster than anyone else. They didn't ask to be in charge, but there was no city, state, or national plan in place to respond to a disaster of this type. New York City construction experts became the de facto leaders at Ground Zero because they got things done. Structural engineers at the site were initially totally occupied with determining the safety and stability of the "piles," the subgrade levels, the "bathtub," and the surrounding buildings. The first structural engineer to realize that there was no plan in place to preserve steel for examination was Abolhassan Astaneh-El of Berkeley, who to this day remains committed to investigating and understanding the WTC collapses. When he brought this matter to the attention of the city in late September, a plan was immediately put in place to preserve the steel for inspection. 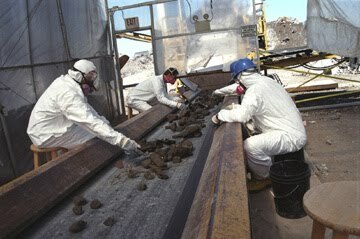 In the meantime, the WTC site was a crime scene, with NYPD Crime Scene Units swabbing steel for tissue and hair samples to be sent to the Medical Examiner's office. A second crime scene was established at Fresh Kills landfill, where over 1,000 people, including hundreds of NYPD detectives and FBI agents, sorted and inspected for evidence 1.2 million tons of debris. Virtually everyone involved agreed that the initial FEMA investigation was insufficient, and a much more thorough investigation of the collapses was undertaken by NIST. "There has been some concern expressed by others that the work of the team has been hampered because debris was removed from the site and has subsequently been processed for recycling. This is not the case. The team has had full access to the scrap yards and to the site and has been able to obtain numerous samples. At this point there is no indication that having access to each piece of steel from the World Trade Center would make a significant difference to understanding the performance of the structures". I do think that statement is an exaggeration by Corley. A small percentage of tower steel was recycled before a plan was in place to have engineers examine it. And I have no doubt that the NIST investigators would have liked to have steel from WTC 7 available. Again, at the time that simply wasn't a priority. This would be a different issue entirely if engineers had requested access to the steel and been denied. For much more information, see Ground Zero cleanup, Fresh Kills sorting operations, Steel scrap issues and read the books Nine Months at Ground Zero, American Ground, and Report from Ground Zero. This is not a mystery. Information about this issue is extremely easy to find. 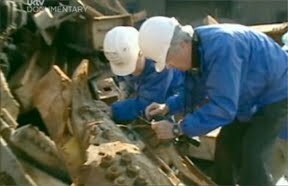 Below: Gene Corley and another engineer inspecting WTC steel at a scrap yard; steel from the aircraft impact zones preserved for study; cataloging steel samples; Fresh Kills sorting operations. Why is that an indication that something powerful came from the bottom? Why not from the top? Many people were in the lobby when the fireball came through. None describe it coming from below. It would "Explain a lot" if I were gay? Rodriguez has been posting at the Loose Change Forum, which is to rational thought what Virgil Starkwell was to the cello. On May 5, Rodriguez wondered if I am gay, and wrote, "anybody have info on that? Not that it is relevant to our debate but it will explain a lot of things if true." Mr. Rodriguez, what would it explain if I were gay?